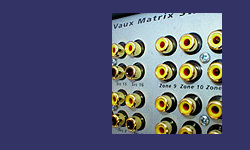 Lattis LE-1216V and LE-2416V video matrix switchers are capable of NTSC or PAL composite video, and/or S/PDIF digital-audio switching. These units may be used in conjunction with our stereo audio switchers, or independently, for providing video and digital-audio routing solutions. Lattis composite video switchers provide high-quality switching of video sources -- digital audio sources may be routed by a dedicated switcher, or you can even use one switcher to handle both video and digital audio. Lattis Composite-Video/Digital-Audio units may be combined with any of our other switchers for various signal routing needs. When combined with our stereo audio switchers, RS-232/Ethernet control provides commands for switching audio/video sources together, or breakaway control for audio-only or video-only switching. I n addition to RS-232 or Ethernet ascii commands, all Lattis switchers may be controlled using infrared commands from an A/Vaux remote control or IR-learning remote or keypad.